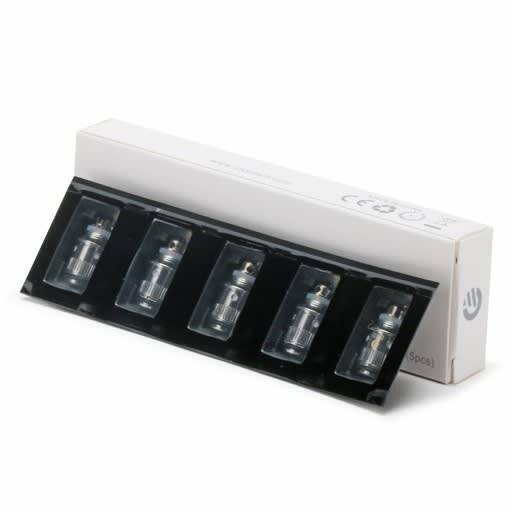 Pack of 5 replacement coils for the eGo One clearomizer by Joyetech. The CL model is the standard one, and comes in either 1.0ohm or 0.5ohm resistance level. In addition to producing more vapor and handling more watts as any sub-ohm coil, the 0.5ohm CL coils also offer a larger airflow hole than the 1.0ohm, giving a longer and looser pull on the inhale, ideal if you like to take long hits with lots of vapor. The 1.0ohm still gives plenty of vapour, but will feel more like a real cigarette with a tighter pull and shorter inhale. These coils are great at .5 ohm but only so so at 1 ohm. Not that the 1 ohm don't work, but .5 is way more satisfying if you have a sub-ohm device.